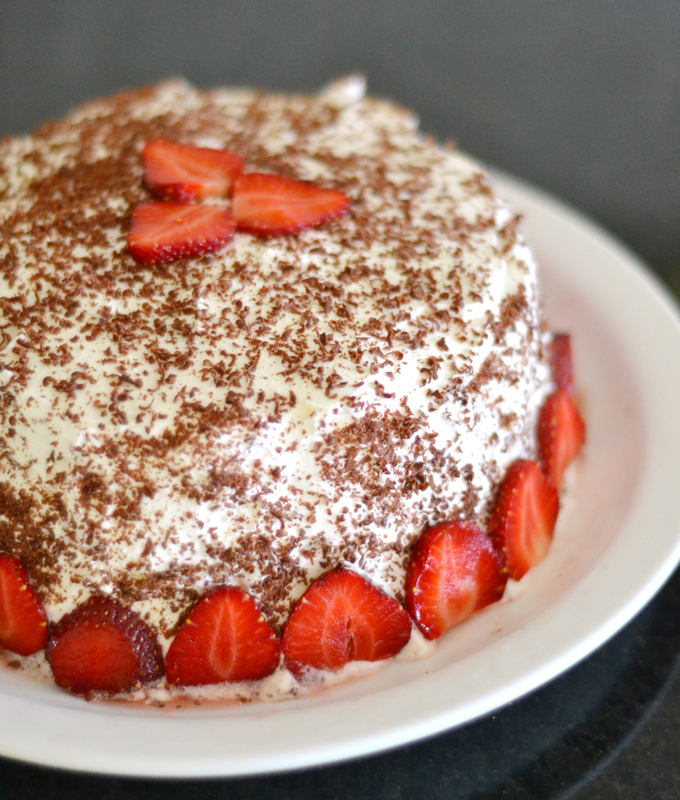 When I was in France, I made my first cake from scratch and a dirt cake for my daughter's third birthday. This year, she wanted me to make her another cake and requested one made out of crêpes. 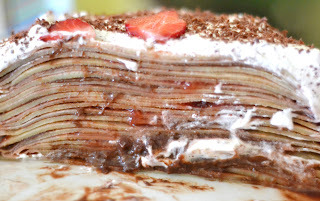 She asked that strawberries and Nutella be included, and as I started to conceptualize this strange request, I finally settled on a milles-feuilles de crêpes cake. Oh, and did I mention that this year my daughter turned five? I'm a little scared to see what she'll request for her Sweet Sixteen. This was challenging for me because I don't often work without a recipe, and because I didn't have any time to make any practice versions, the first attempt was her actual birthday cake. It was time consuming, but it's easily done in stages. First I made the crêpes--I made mine the night before and just stuck them in the fridge covered in plastic wrap. Then when I was ready to assemble the cake, it just took a little time and patience. I found that it was important to keep the filling layers thin because the crêpes have a tendency to slide around. I only wish I had had a very sharp knife. We were renting a house at the beach with dull knives, and the result was a messy cake. Regardless, it was delicious! 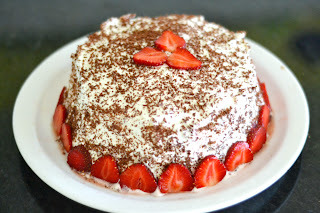 Any filling would do--whipped cream, pastry cream, Nutella, preserves, fresh fruit (if smashed a little to keep the layer even) or another filling of your choice. 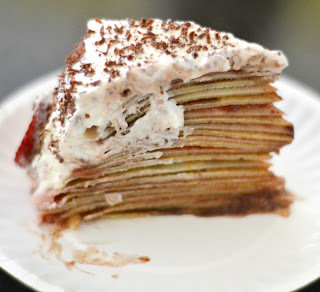 I covered mine in whipped cream because it looked slightly ugly without something on top, but I've seen pictures of very beautiful mille-feuilles de crêpes cakes just dusted with powdered sugar. Go with your instincts on this one. :-) It turns into a crêpe heaven with oozing, gooey layers that can be eaten with a fork, but I recommend eating like a five year old...with your hands. To make the crêpes: Place all of the ingredients in a blender (liquids first) and blend until smooth. Cover and refrigerate for at least 30 minutes or up to a day. When the batter is ready, heat a small frying pan (I use an 8-inch omelet pan.) over medium-high heat. If your pan is not completely non-stick, place a tiny bit of butter in the pan. Once it's melted, pick up the pan and quickly pour in 1/4 cup of batter, swirling the pan with your wrist to spread the batter evenly. If you have a whole or two, dot them with a little more batter. Place back on the burner and cook for about 30-90 seconds. Using a small spatula, release the edges of the crêpe from the pan while it's cooking. Once the bottom is starting to brown slightly, use your fingers (or as I prefer, one tiny and one larger spatula) to lift the crêpe gently and flip. Plan on using the first couple of crêpes as test crêpes--my first one never turns out right! Once the second side starts to brown slightly, remove from the pan to a plate covered in wax paper. Repeat the steps above until the batter is gone. 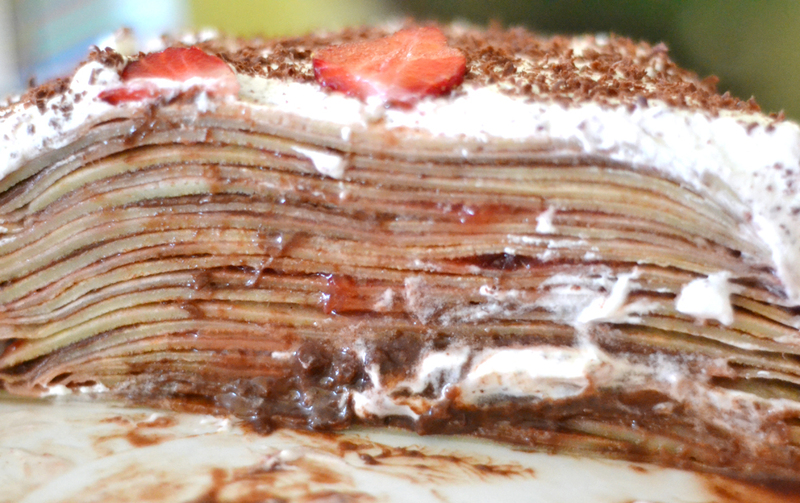 You can layer the crêpes without anything between them. Once cooled, you can cover them with plastic wrap and store them in the refrigerator for up to two days or place in an airtight container in the freezer for up to a month. To make topping: Pour very cold cream into a deep bowl. Add the vanilla and sugar and beat with a hand-mixer until medium-stiff peaks form. To make the cake: Place a crêpe on your serving platter. Spread a light layer of Nutella over the crêpe. Add another crêpe and spread a light layer of strawberry preserves. Continue until your desired height or until you run out of crêpes. I used about 20. If you are planning on serving right away, frost the cake with the whipped cream, shave chocolate over it and top with strawberries. If you will be serving the cake later, cover and place in the refrigerator. If using preserves, some of the "juices" will leak out. When you're ready to serve, just wipe up the plate with paper towels and then decorate the cake. Cut with a very large, sharp knife. Enjoy! I LOVE this idea! (The best part is that your five-year-old daughter requested it!) I will definitely try to make this. When I was a culinary school student (I wrote about it here, if you're interested: "Culinary School: Three Semesters of Life, Learning, and Loss of Blood" http://amzn.to/eOKJWw - on Amazon Kindle) I had a chef who said the ideal crepe was so thin it was only two dimensional! Thank you so much for sharing this useful information here with us on your blog. Looking forward to read more details on the same. In avant-garde society, all the ladies acquire appearance consciousness. All of them would like to http://www.tmssoftware.com/site/pull.asp buy appearance artist accoutrements to accompaniment themselves in a beautiful statement. Why do them adulation advancing these admirable faddy handbags deeply? Because they all anticipate that owning a absolute chichi bag of any acclaimed cast is admired as their cachet symbol, which adds different in their personality and emphasizes their character greatly. Among these accomplished items, artist Louis Vuitton is one of the a lot of prada belts accepted brands accouterment a advanced ambit of superior and fashionable bags, chichi wallets and faddy purses. The acclaimed cast LV has accustomed itself as a apple arch cast name in the appearance amphitheater in the accomplished decades. If you apperceive Louis Vuitton more, you will acquisition that the acclaimed cast consistently produces new accumulating of appearance handbags, beautiful purse, aerial wallets and archetypal accoutrements to every faddy woman. All the articles are the huge allurement for appearance lovers. LV artist appearance handbags are fabricated of acceptable superior covering and they acquire admirable adroitness and active different symbol. All of their appurtenances are avant-garde and appropriate and they are offered at reasonable prices. However, due to the aloft reasons, the prices are absolutely top that few of humans can allow the goods. Therefore, they alone acquire to louis vuitton replica get artist replica bags, appearance abatement purses and bargain artist wallets of the aforementioned name. For the appearance consciousness, avant-garde ladies charge to buy assorted appearance accessories to bout able-bodied with their faddy outfit, appropriately they charge lots of money to pay for them. So it is no aberrant that women adopt to buy replica artist Louis Vuitton handbags, abatement appearance purse and chichi bargain wallets. These artist replica appurtenances are about the aforementioned as the 18-carat ones that you can appearance them to your relatives, accompany or your ancestors memebers in chanel replica any appropriate occasions.